A beautifully balanced, creamy smoothie that unites all of the flavors and provides a dose of several medicines. This is definitely not your typical smoothie. And, to be honest, this MAY be controversial… I don’t generally like smoothies all too much. It’s not like they taste bad; I just find them, on average, to be rather one-note, and uninteresting in terms of a gustatory experience. This, however, is a beautiful, thick beverage that, sure, has a base of fruit and nut milk, but in this case it’s actually a clever application of traditional, medicinal ingredients that are the flavor stars of the show (as “boosts” or “add-ins”). This well-designed concoction is the creation and daily staple of my good friend & mentor, Jon Taguchi. It was made with the intention of powering his body and brain in an efficient way so he could spend more time focusing on his trades of design & woodwork. I really encouraged that we feature it, because just like many of what Jon makes, I find it genius. It may be the only smoothie I’ve had that plays on just about every flavor. 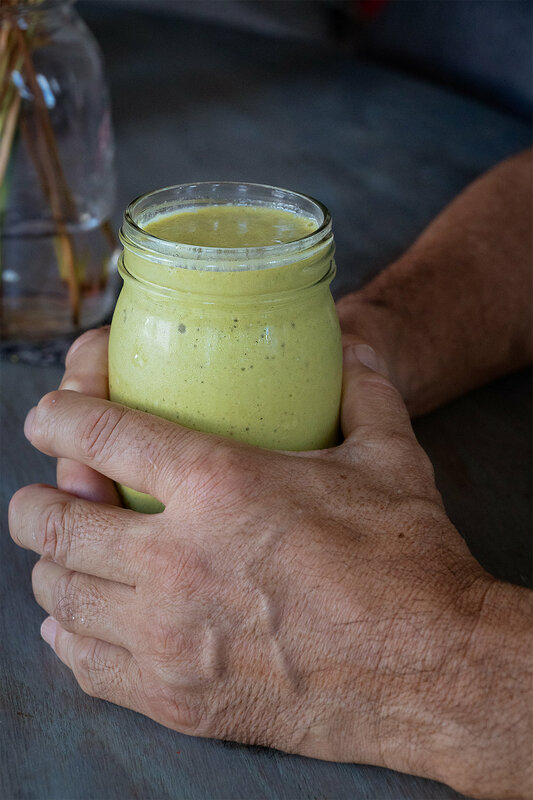 Lots of smoothies are sweet and tangy, and this one has those elements, too, as it uses frozen banana and mango as well as sweetened hemp milk as its base. However it also introduces a pronounced bitter element with matcha green tea and fresh turmeric (“olena” in Hawaii); spicy with fresh ginger and black pepper; astringent and umami from the matcha ; salty from hemp seeds; and even floral and smoky elements from the heavy hand of cassia cinnamon and the touch of vanilla. In addition to this well-rounded tastebud symphony, the multi-faceted nature of this gem recipe includes the distributed profile of fat (hemp + coconut), sugar/carbohydrate (fruit, sugar in hemp milk), protein (hemp), and caffeine (matcha). And even another layer of intelligence is in the duo of inspiration that melds quite in the middle of a matcha latte and a golden milk. I’m telling you… this guy is a master! And food isn’t even his medium!! Okay, I’ll stop gushing now, and introduce you to the recipe so you can become a protégé, too. These hands make good things. This muted golden-green smoothie, for one. A moment of simple satisfaction. Well, this post is winding down but don’t worry, you haven’t seen the last of Jon and his handy work. I hope to feature his inspirations regularly here, as he is indeed part of the extended Space & Light team. I want to give big kudos and appreciation to all of you guys who have made our recipes and sent em our way. Please keep doing that! It fuels our fire. If you share our recipes or your own creations inspired by our posts, please tag us! @spacenlight and/or #31NYR on Instagram/Facebook. What recipe would you love to learn to make at home that is too daunting to face? Maybe we can simplify it for you!